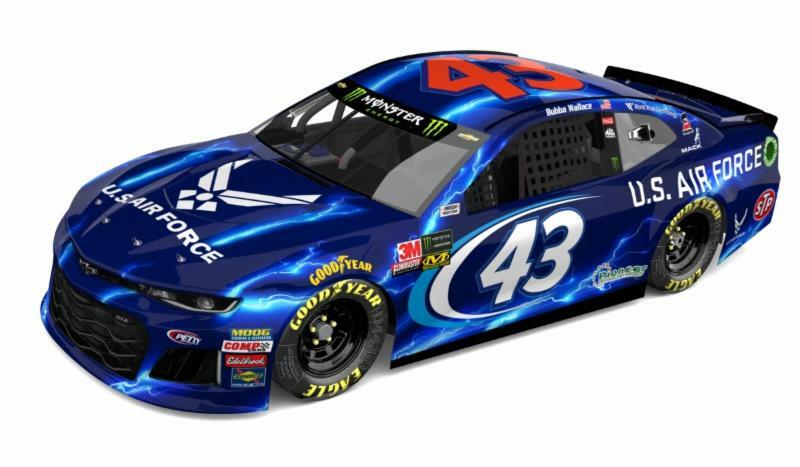 The Air Force and Richard Petty Motorsports announced today they will continue their 11th consecutive year of partnership together in the Monster Energy NASCAR Cup Series in 2019. The Air Force will continue to be a two-race primary sponsor of the famed No. 43 with driver Bubba Wallace, as well as a major associate throughout the season. Air Force Recruiting Service, charged with the mission to inspire, engage and recruit future Airmen, sees the continued association as an opportunity to build awareness about the Air Force. The Air Force has also witnessed the excitement that Wallace Jr. has brought to inspiring recruits in 2018 during his first year representing the Air Force. As a partner of the No. 43 Chevrolet Camaro ZL1 team, the Air Force colors will again be featured during the two most patriotic race weekends of the year: July 4 weekend at Daytona (Florida) International Speedway and Veterans Day weekend at ISM Raceway in Phoenix, Arizona. In his first year partnering with the Air Force, Wallace Jr. engaged with current Airmen and aspiring recruits. He visited four different U.S. Air Force bases, including Randolph in San Antonio, Texas, Seymour Johnson in Goldsboro, North Carolina, Wright-Patterson in Dayton, Ohio, and Shaw in South Carolina. Wallace Jr. participated in different drills at each base and took flight in an F-16 with the 77th Fighter Squadron known as the “Gamblers” at Shaw AFB, SC. Wallace Jr. also spoke with high school students about reaching their goals. In addition to various visits away from the track, Wallace Jr. and “The King” Richard Petty meet young men and women of the Air Force each weekend along with Air Force leadership.